The Tupelo Regional Airport was right outside the Furniture Market where I am currently attending. As we were in the car getting from one exhibition complex to another, we drove by, with the airport in full view when Wilson started his funny story about the airport. While most of us came to Tupelo by car, Wilson flew in direct from Atlanta. 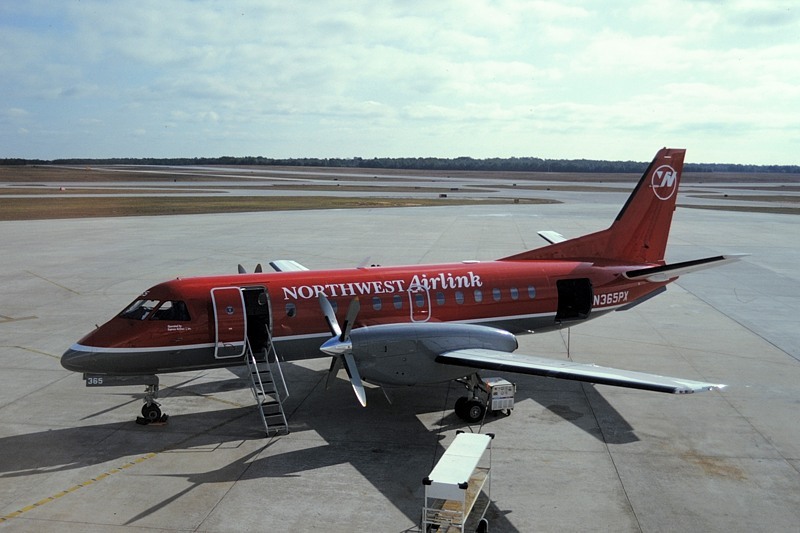 The Saab-340 (pictured above) is a small plane that carries only 30 passengers and he was bitching about the fact that it took him over 30 minutes just to get off the plane when it landed. What happened was that Tupelo airport got their first ever aero-bridge and was supposed to use it to receive this flight. Problem is that the aero-bridge was so new that the operator was still struggling to figure out how to work it. As a result, with everybody inside standing and waiting in anticipation to get out, the poor operator just couldn't get the aero-bridge to mount the plane correctly. 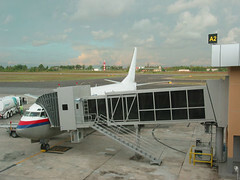 Wilson was saying that the aero-bridge keep missing the door of the plane like a drunken snake. In the end, another ground crew got fed up, walked to the plane with the portable staircase and voila! Problem solved. Then John joined in with his anecdote from the last market. He was leaving Tupelo that fateful day when he was served by this African-american woman at the check-in counter. Then later, as he was at the waiting area looking out of the window at the Saab-340 that he was about to board, he saw the same woman outside loading the luggage into the plane. Then later, when the last piece of luggage got loaded, he saw her running back into the airport via their departure gate to pick the PA system microphone announcing that the plane was ready for boarding. There she proceeded to collect and validate the boarding passes. The real kicker here is that where the last passenger was on board, the door closed and the plane ready for push off from the gate, John couldn't believe his eyes and burst out laughing like a mad man when he was looking out through the window. There she was, the same woman, waving the luminous sticks guiding the plane out of the gate. Talk about bao shuar, bao hai man..... Limbeh five body throw floor (五体投地) siah. RESPECT. akk: The great thing about this woman is that she is doing this everyday as part of her daily task. No complaining, no whining, no bitching. Just do it. Si beh stay-dee. Toufu: There is a strike going now in Northwest but only by the mechanics' union. The ground crew, flight attendants' and pilots' union all refused to join in the "sympathy strike" which means that the mechanics are very much on their own. While they are striking, NW is contracting those mechanics who were laid off from other airlines to fill the gaps. Hopefully, my returning flight will not be affected. How about Cayman Islands airport? I bet the guy who man the counter, who loads the luggage, who makes the announcement, who shuts the door, who signals the plane, who flies the plane, who serves the drinks ... is also the guy who runs the gift shop, who runs the surf shop, who runs the fishing outfit, who conducts the scuba diving tour, who drives the taxi ... Ulu place lah, wat to do? What John described is quite true at small regional airports in the U.S.
Aston Villa: Er... who's John?